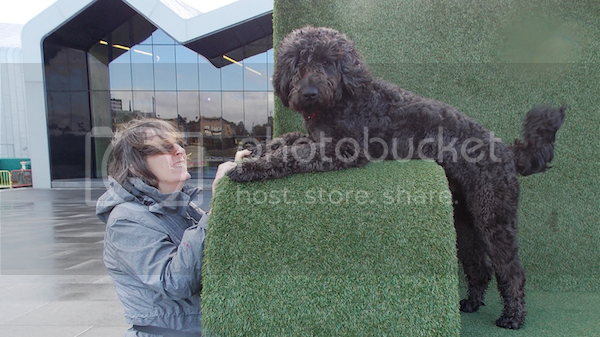 UK Labradoodle Association • View topic - Jumping up, but only indoors. Post subject: Jumping up, but only indoors. as a young pup Woody would bound up to everyone & jump up for some fuss. We addressed this by getting people to ignore him & we would give him a treat upon sitting (& he'd get the fuss he was after.) it worked at treat & no more problems when out. The difficulty we are still having ( Woody being almost 9 months now) is his jumping up when we come home or whenever we have visitors to the house. We are trying the same methods....we walk in & tell him "off" then ignore him & walk round to his bed. When he sits (or goes down) either on his own or by us telling him to, on his bed we give him some fuss ( a stroke / cuddle etc.) it sort of works, but only just & is hit & miss still. Any suggestions / tips for helping us with this phase would be greatly appreciated. Post subject: Re: Jumping up, but only indoors. So pleased to see that my Artful Dodger isn't the only one to be tempted by treat bags, marymuffin! As DoodleDee has suggested, consistency is the key. I thought Ianto would never stop leaping about like a lunatic... but he has calmed down a little recently. Perhaps try putting Woody in a separate room when visitors arrive, then introduce him when they've settled down? The consistency aspect certainly seems to be the reoccurring theme. In which case I guess I need to just carry on & eventually it should come. I know what you mean Doodle Dee.......perhaps I Need to train my husband first, he's not great with 'doing the same thing as me' either. I like the idea of trying a houseline for a while Ianto! I tried putting him in a different room or just putting him in open kitchen with baby gate up so he can see everyone, but not get to them.......worked a little, but with some people, not so much.